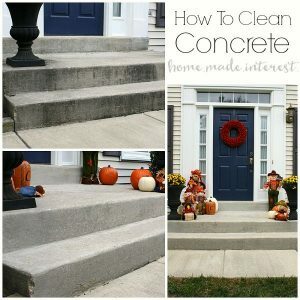 How to Clean Concrete - Home. Made. Interest. 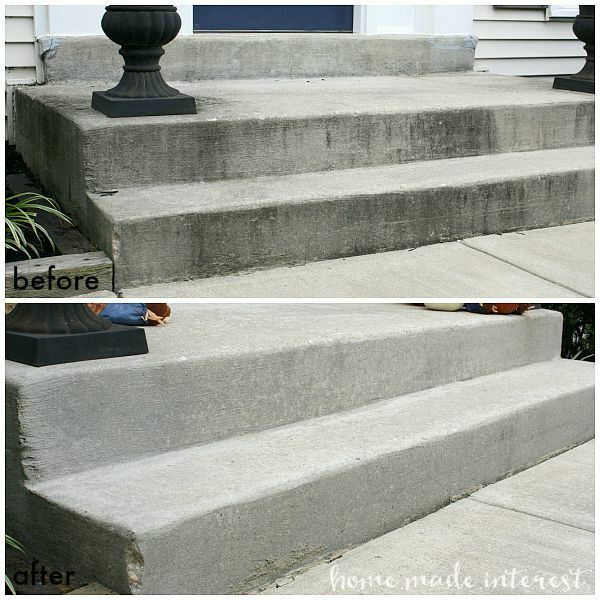 This simple DIY home improvement teaches you How to Clean Concrete and increase your home’s curb appeal! Alright, some of you might remember that I did a little front of the house refresh last month and painted my front door. 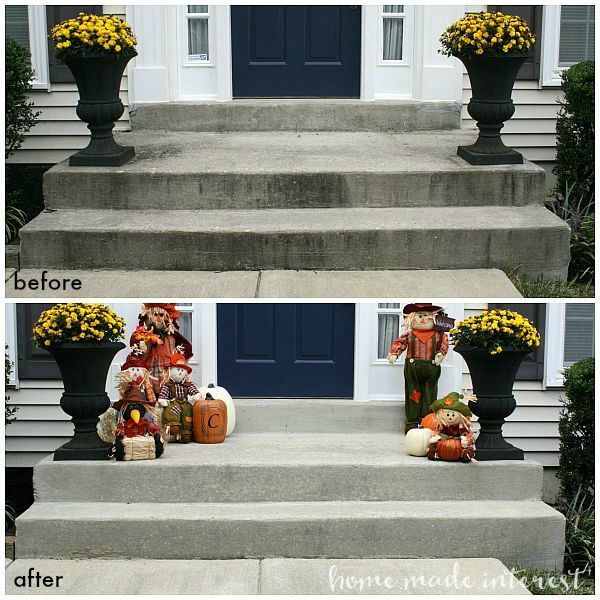 I’m still loving it but when I looked at those “after” pictures I realized how gross my front steps looked. 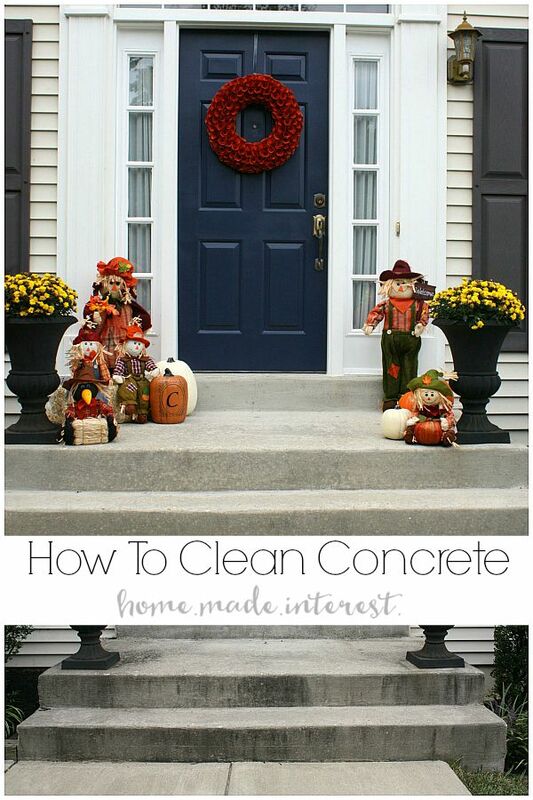 They had so much dirt and mildew on them, and sprucing up the front door made it really obvious that I needed to clean my concrete. Before I got down to business I prepped the area by sweeping the steps clean and covering the bushes, and grass, directly next to the steps with plastic sheeting. 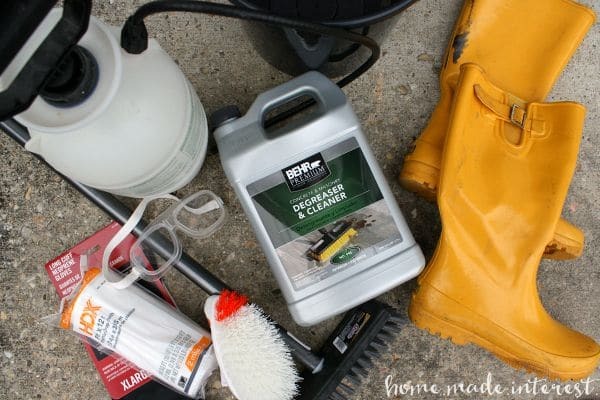 The BEHR PREMIUM® Concrete & Masonry Degreaser & Cleaner is strong stuff and I wanted to make sure the bushes, and my grass, were as protected as possible. 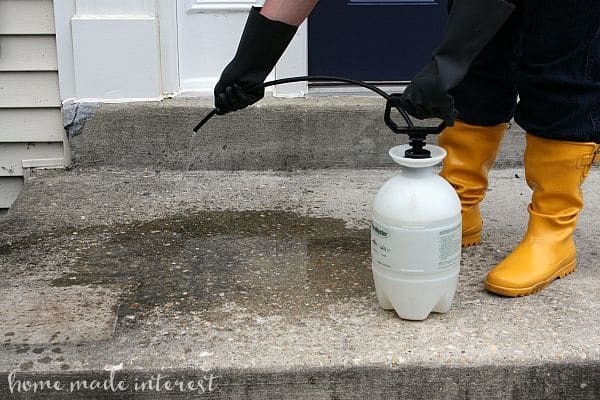 When the area prepped I diluted the BEHR PREMIUM® Concrete & Masonry Degreaser & Cleaner with water, mixing it according to the instructions in a plastic bucket. Then I poured it into my pump sprayer and saturated the area I was working on. It’s fall here right now but it was a warm sunny day. The product is not supposed to dry on the concrete so I worked in sections, doing one area at a time. 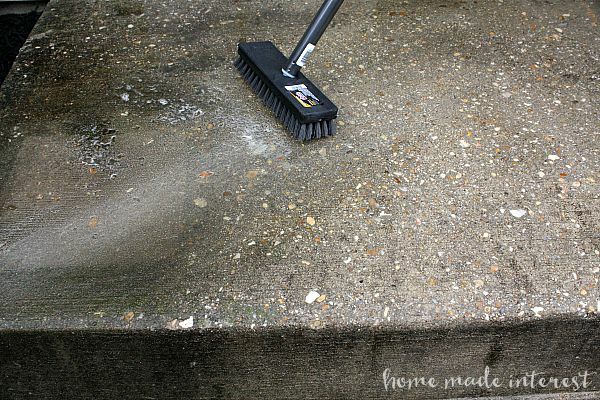 Once I had it covered in cleaner I let it sit for 10-20 minutes and then used my deck brush to scrub the concrete. It is hard to see it in the pictures but there was an immediate different. The black mildew came up easily. Of course there were a few spots that needed a little extra attention but in the end I managed to get rid of all of it! The cleanup was pretty simple. I hosed everything down, tools, concrete, bushes, and grass, to saturate it with fresh water and then I removed the plastic sheeting from the bushes and grass and watered them a little more. Nothing was damaged in the cleaning process, thank goodness! My husband would have been so mad if I hurt his grass, LOL. Isn’t the difference amazing? How did I never realize how dingy and dirty everything had started to look? Now I feel like the front of the house is in pretty good shape and I am enjoying dressing it up for the holidays! 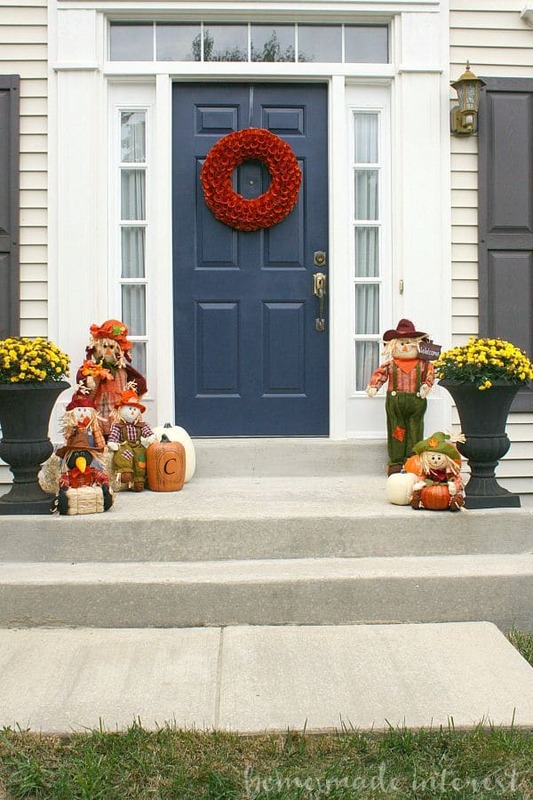 If you missed Part 1 make sure to check out my tutorial on How to Paint an Exterior Door. « Previous PostSuper Cute Holiday Gift Tags – Free Printable!